If you've been wondering what Ford's big plans were for dealing with the new energy bill and higher CAFE standards and guessed hybrids or electric cars &mdash you were wrong. 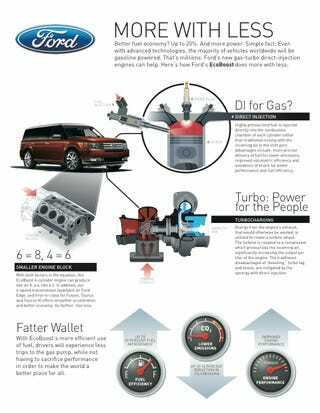 Ford's big plan is to add turbocharging and direct injection to 500,000 vehicles, starting with the 2009 Lincoln MKS. Ford claims this technology will boost performance while also affordably decreasing gasoline usage. According to their numbers, an EcoBoost car can recoup the initial investment in the technology in 30 months, compared to 12 years for a hybrid and 7.5 years for a diesel. The press release detailing this wild technology below the jump. Senate Passes Revised Energy Bill, Hybrid Escalades For All! DETROIT, Jan. 6, 2008 - Ford Motor Company is introducing a new engine technology called EcoBoost that will deliver up to 20 percent better fuel economy on half a million Ford, Lincoln and Mercury vehicles annually in North America during the next five years. The EcoBoost family of 4-cylinder and 6-cylinder engines features turbocharging and direct injection technology. Compared with more expensive hybrids and diesel engines, EcoBoost builds upon today's affordable gasoline engine and improves it, providing more customers with a way to improve fuel economy and emissions without compromising driving performance. Ford's 3.5-liter EcoBoost V-6, for example, can deliver upwards of 340-plus lb.-ft. of torque across a wide engine range - 2,000 to 5,000 rpm versus 270 to 310 lb.-ft of torque for a conventional naturally aspirated 4.6-liter V-8 over the same speed range. At the same time, this V-6 gives customers an approximate 2 mpg improvement and emits up to 15 percent fewer CO2 emissions to the environment. EcoBoost - combined with multi-speed transmissions, advanced electric power steering, weight reductions and aerodynamic improvements - is part of Ford Motor Company's strategy to deliver sustainable, quality vehicles that customers want and value. Additional hybrid offerings and diesel engines are planned for light-duty vehicles.